The Chimney Corner, by Joseph Clark. (1834-1926). By the mid-19th century the chimney corner was already becoming a relic of the past, however, for colonial Americans it was perhaps the most beloved space in the home. The chimney corner is defined as the space inside a massive 18th century (or earlier) fireplace and the jamb on either side of the fire where one could sit easily and comfortably by firelight. This may sound as if the occupants were roasting themselves, but those early fireplaces were so massive that there was plenty of space for sitting and other activities a safe distance from the fire that often burned on one end of the hearth. The 18th century mantle was also very large, extending the length of the ample fireplace and hearth upon which sat an array of utensils. From the mantle or door jamb hung other tools such as tongs, an iron fire-shovel, a bellows, brushes, etc. A chimney corner from a vintage postcard, date unknown. 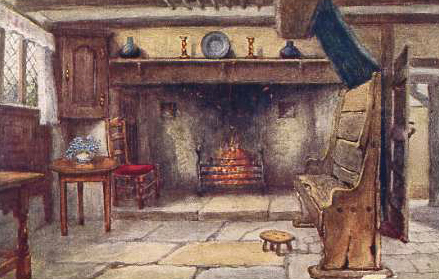 The chimney corner, also called an inglenook from the late 19th century, was a cozy place, remembered and loved by everyone who experienced its charm. The old chimney corner! It is endeared to the heart from the earliest recollection. What dreams have been there! What stories told! What bright hours passed! It was a place to think in, a place to weep in, to laugh in, and much the coziest place in the house to rest in. 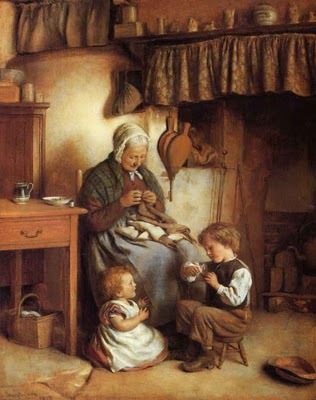 It was there that dear old grand-mama used to sit at her knitting warming her poor rheumatic back against the warm wall; where grandpa used to fall asleep over his newspaper, where mama used to place her spinning wheel, and papa used to sit there too, and read in the great armchair. Samuel Goodrich recalled the pleasures of the chimney corner of his childhood. Meat was kept suspended in the chimney corner as evidenced from the following account. 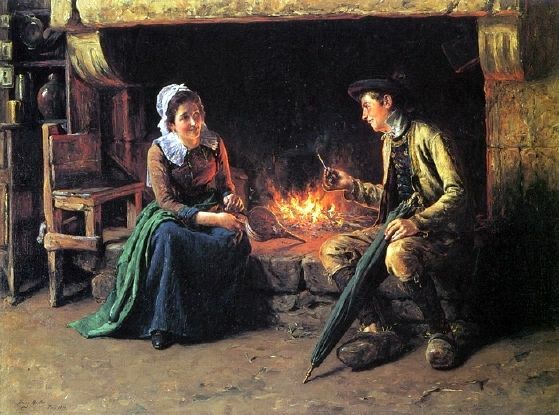 Literature through the 19th century is filled with references to the chimney-corner, ranging in importance from a mere title for a collection of stories or poems, to a description of the chimney-corner and its contents. Reader, you may still wonder at this point about the size of a chimney corner and its particulars which the following passage may explain. We have seen the chimney-corner as the focal point of the 18th century kitchen with its cook pots and kettles simmering away, as the warm nook for elders too frail for the colder parts of the house, as a private area for courting couples, and as a platform from which to preach the gospel. The following account sums up that long forgotten space remembered so fondly and makes us yearn for the warmth and security it offered while showing us a need for education so strong that even one bound to labor through the years with not a bit of compensation for his worldly needs rose early and retired late in order to attain a degree of betterment for himself. Can any of us say we would be so diligent? Education in the Chimney Corner, Mr. Haynes, the Colored Preacher. It is well known that chimneys among the early settlers on the western hills in New England were of a peculiar structure. They were built of huge stones, with a broad base, occupying at least one third of the ground covered by the building. The fire-place seems to have received its form either with reference to its consuming the greatest quantity of fuel, or for the purpose of forming a kind of sitting-room for the younger members of the family. Hence the fire-place was nearly eight feet between the sides and a full yard in depth. In one extreme was the oven, and in front of it was the long square block, which would comfortably seat the children, one, two, or three in number, as the case might require. Such was the chimney-corner where Lemuel Haynes in his childhood laid the foundation of his future usefulness. While his mates were sporting in the streets, and even round the door, you might see him sitting on his block with his book in his hand. Evening after evening he plied his studies by fire light, having the preceding day laid in a store of pine knots and other combustibles for the purpose. The luxury of a candle he rarely enjoyed. Here he studied his spelling-book and psalter till he had literally devoured them. He studied the Bible till he could produce by memory most of the texts which have a bearing upon the essential doctrines of grace; and could also refer, with nearly infallible accuracy, to the book, chapter, and verse where they might be found….All this and much more he accomplished on his block, in the chimney-corner, by fire-light. At the same time no boy in the neighborhood performed a greater amount of manual labor. Bound by indenture as a servant, he was obliged to labor hard through the day, so that the hours of the evening and the twilight of the morning were his only time for mental improvement. Reformed Church in the United States. The Guardian. Vol. 14-15. Nov. 1863. Goodrich, Samuel Griswold. Recollections of a Lifetime. 1856. NY. The New England Kitchen Magazine. Vol. 1. The Gentleman’s Magazine. March 1828. The Friend. Vol. 44. Feb. 18, 1871. Borrow, George Henry. Wild Wales: Its People, Language, and Scenery. 1862. London. Parley’s Magazine. 1837. New York and Boston. 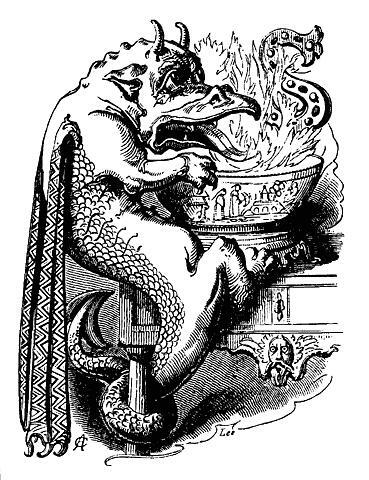 A dragon playing the game, Snap-dragons, 1879, from Robert Chambers' "Book of Days"
Would you be surprised to learn that drinking games are not just a modern indulgence, but in fact have been practiced for hundreds of years? My first encounter with “snapdragons” was at a French & Indian event and frankly I thought the participants were nuts. I had no idea their entertainment was grounded in history. I still think they’re nuts, but that’s coming from a woman whose drinking days are long over. Others may find it more appealing; however, I’m sharing the information for historical reference, and not at all suggesting anyone participate. Snap-dragon, or flap-dragon, as it was known in its earliest form, may refer to the parlor game, the fruit used when playing the game, or the bowl which contains the fruit. To play the game brandy is poured into a wide shallow bowl containing a quantity of raisins, and then the brandy is ignited. Participants must reach into the flames, retrieve a burning raisin, and pop it into their mouths at which time the flame is extinguished and the raisin eaten and swallowed. Other fruit was sometimes used but the most commonly mentioned in period accounts is raisins. The raisins acted like a wick soaking up the brandy and holding the flame. Obviously burned fingers, lips, and tongue can and often do occur. Some accounts state the game originated in old England; however, if it did they certainly weren’t the only ones to play it. Other sources claim the Dutch were adept at playing it as well. At this point the reader must be asking to what end someone would want to play such a game. For the answer we look to Richard Steele’s account. 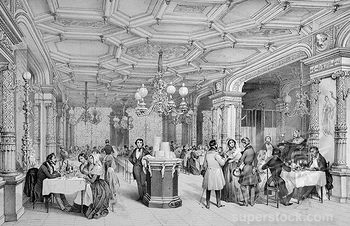 “The wantonness of the thing is to see each other look like a demon, as we burnt ourselves and snatched out the fruit.”  The eerie effect was increased by dimming the lights so that the flickering blue flames from the burning brandy cast a moving light shadow about the room. Chambers wrote that in that version a lighted candle-end was placed into a vessel of cider or ale and participants attempted to drink the contents without suffering a burn from the candle flame. The raisins were sometimes replaced with almonds, dried currants, candied fruit, figs, and plums, also probably dried versions of the latter. Perhaps the version found in The Book of Days  was one of the more interesting ones. The participants recited the following verses. At least according to Chambers, my Scottish ancestors, though they may have enjoyed their cups, did not practice the custom of Snapdragons. Of all the speculation on how the game originated, Chambers’ theories seem the most likely. The New England Kitchen Magazine, April 1895. Bird, Frederick Spencer. The Land of Dykes and Windmills. 1882. London. The Gentleman’s Magazine. July 1789. Johnson, Samuel. Dictionary of the English Language. 1755. London. Steele, Richard. Isaac Bickerstaff. http://www.blackmask.com/olbooks/bickerstaff.htm. Walsh, William. Curiosities of Popular Customs and of Rites, Ceremonies, Observances, and Miscellaneous Antiquities. 1898. Philadelphia. Shakespeare, William. Henry IV, Act ii, Sc.4. Blain, Mary. Games for Hallow-E’en. 1912. NY. Chambers, Robert. Chambers’ Book of Days. J. B. Lippincott & Co. 1879. Philadelphia. This obviously isn’t the sort of title you’d expect to find on The Historic Foodie’s Blog, but even I live in an ever increasingly stressful world, and some of these concepts may not be so far out that I can’t appreciate them on some level. Strangely enough, when I’m cooking at some historic venue, I have the patience of Job, never rushing, always nurturing and coaxing every bit of flavor possible out of my dishes while smoke from the coals rises with the pleasing fragrance of the dish, yet when I’m eating out I have little tolerance with servers who drag their feet taking my order or bringing the check when I’m finished. Restaurants in more modern cities than the one in which I live are going electronic in the way they take orders and have you pay for your meal. Sorry, but you’ll still need that server to bring you the food. Even those with the lowest tech skills will love this one – no more heavy, bulky beepers to alert you when your table is ready. When you sign in with the hostess you give her your cell phone number which goes into an auto-system and texts you when your table is ready. An upgrade is already in the works for this one which will allow us to put our names on the waiting list before even leaving home to speed up the process of being seated on arrival. I’m about as low-tech as one can get and honestly I enjoy the conversation with a personable server who gives me great service, but all too often in the last few years I seem to get the droll person with no people skills, can’t get my order right, and thinks drink refills are for people sitting at other tables. We’ve left restaurants because no one made any effort within 15 minutes to take a drink order or even greet us. One of my biggest pet peeves is outsourcing jobs when responsible adults are stuck in low paying boring jobs which do not cover living expenses, but as bad as I hate to admit it maybe some of these systems have merit. Don’t expect one-on-one contact though, because some of these systems are manned in customer service facilities many, or even hundreds, of miles away. Lagniappe refers to an extra, or a small gift apart from a service which you’ve paid for. Consider this post such an extra. In my next post we’ll return to a former time when service was extended in a timely manner with a smile. When gardens are producing vegetables faster than we can eat the produce the logical thing to do with the surplus is to preserve it for winter use. 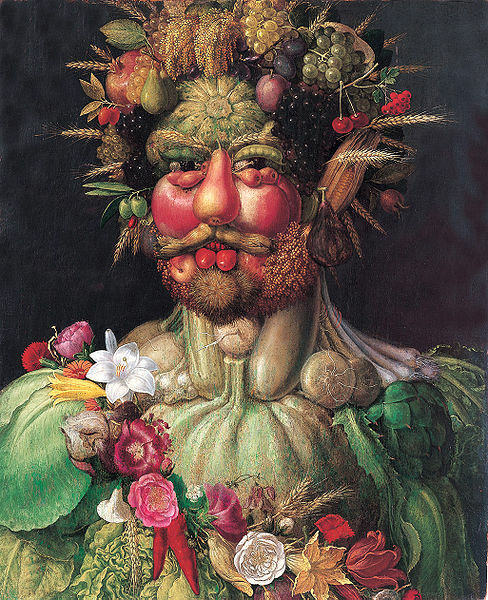 Doing so was extremely important in earlier times and the primary ways to preserve vegetables were drying and pickling. In this week’s posting we’ll have a look at the drying process. Perfecting food preservation methods was promoted through the agricultural fairs with premiums paid to those whose processes were considered improvements or new methods, thus the fairs of earlier decades did much for perfecting various aspects of agriculture. Drying Vegetables for Long Keeping. At a late meeting of New York farmers specimens of various vegetables were presented, soup made from them exhibited, which had been dried by a secret process, so that they could be kept for an indefinite length of time, with a perfect retention of flavor. They are cut into thin slices before subjected to the drying process, but this is all the information on this point that we are favored with. The process originated in France, where for some years it has been in successful practice. It has been tried with satisfactory results on all common vegetables, except potatoes and beets. The New-York Agricultor says: ‘We tasted (imported) cabbage, and found it as good as new-to our taste’. Cabbage loses about fifteen parts of water out of sixteen, by the operation,–carrots about nine parts out of ten. The cost of preparation is said to be about two cents for each pound of the dried articles. They have already remained uninjured during a four years sea voyage. Vegetables dried in this way, we should think, would form an excellent accompaniment for meat biscuit. – The Country Gentleman. Vol. 2. July 28, 1853. Albany, NY. Drying fruits and vegetables was always an important safeguard against shortages once the growing season ended, but in times of war that importance increased ten-fold. As men took up arms the labor force on the farms shrank but the need for large amounts of food increased as efforts were made to send all that could be spared for the use of the military. The following account urged Southerners to dry any vegetables at their disposal and ship all they could to feed the troops during the Civil War. Wash the roots clean, and grate them on a coarse grater, such as is used for horse-radish. Spread the pulp thinly on trays and dry in the sun, or in an oven heated to a temperature not above 125 to 130 deg. F. A greater heat will injure the result. When perfectly dry, the mass should be compressed into as small a space as possible, and packed in paper like smoking tobacco. A coat of varnish would render the paper water-proof. Green corn could probably be kept in the same way, though the writer has never tried it. Vegetables, thus preserved, lose none of their nutritious properties, and make an excellent ingredient in soup. Everything depends on the entire exclusion of moisture. Frequent exposure to the sun, is very desirable…Those who have abundance of vegetables, cannot render a better service to their country than by thus preparing them for the use of the army. J. D. Easter, Ph. D. Rome, GA, June 1863. – Southern Cultivator. Vol. 20-22. Nos. 7 & 8. July & August, 1863. Augusta, GA.
Below are two common early receipts for using dried vegetables which were published in multiple cookbooks. TO MAKE A HARRICO OF FRENCH BEANS. Take a pint of the seeds of French beans, which are ready dried for sowing, wash them clean, and put them into a two-quart sauce-pan, fill it with water, and let them boil two hours; if the water wastes away too much, you must put in more boiling water to keep them boiling. In the mean time take almost half a pound of nice fresh butter, put it into a clean stew-pan, and when it is all melted, and done making any noise, have ready a pint bason heaped up with onions peeled and sliced thin, throw them into the pan, and fry them of a fine brown, stirring them about that they may be all alike, then pour off the clear water from the beans into a bason, and throw the beans all into the stew-pan; stir all together and throw in a large tea-spoonful of beaten pepper, two heaped full of salt, and stir it all together for two or three minutes. You may make this dish of what thickness you think proper (either to eat with a spoon, or other ways) with the liquor you poured off the beans. For change, you may make it thin enough for soop. When it is of the proper thickness you like it, take it off the fire, and stir in a large spoonful of vinegar and the yolks of two eggs beat. The eggs may be left out, if disliked. Dish it up, and send it to table. – Glasse, Hannah. First Catch Your Hare. 1747. London. This receipt was retained in her subsequent book The Art of Cookery Made Plain and Easy. 1774. London. TO FRICASEE ARTICHOKE BOTTOMS. Take either dried or pickled artichoke bottoms; but, if you use dried, you must put them in warm water three or four hours, shifting the water two or three times. Have ready a little cream, and a piece of fresh butter, stirred together one way till it is melted. Then put in the artichokes, and dish them up as soon as they are hot. – Williams, T. The Accomplished Housekeeper and Universal Cook. 1797. London. I hope this bit of information will be of interest and spur the gardeners to be thrifty with the last of the garden’s bounty.